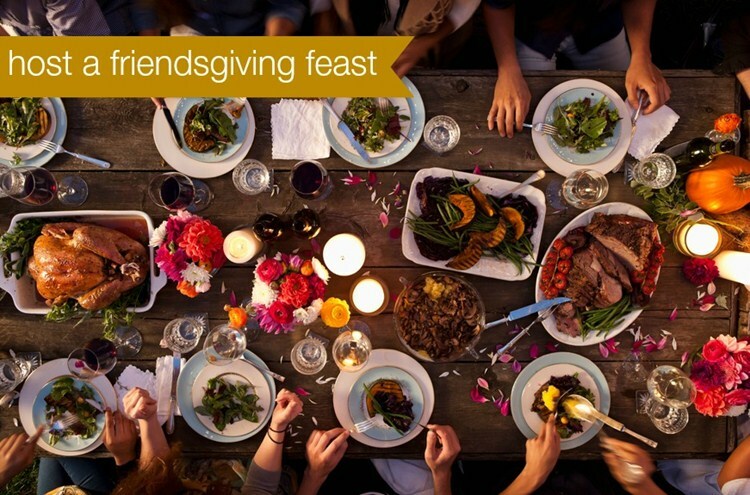 HAPPY FRIENDSGIVING: Tips for Hosting the Perfect Turkey Day with Friends! Most of us grow up spending Thanksgiving with our families. Football plays in the background, family catches up (aka argues!) and a turkey in the oven. However as adults, many of us have become hosts of Friendsgiving! “Friendsgiving”—aka a Thanksgiving celebration with friends can be a great way to still celebrate old traditions with the family you’ve chosen in the area you now live. In Los Angeles, it’s also the perfect excuse to skip out on the hours of traffic traveling home! But, some of us have never actually been in charge of throwing Thanksgiving before. Having it at your own home can be a bit intimidating, even amongst friends. We checked in with design expert, Jeffrey Welder (Owner of Vänt Wall Panels Design) for his tips to throwing the perfect turkey day dinner from ambiance to food to who’s doing the dishes! · The Invitation List. It’s a good rule of thumb to invite friends who are grateful to share your table. Stick with a good group of people who are unlikely to create stress or drama. Try to invite like-minded friends and those that you think will get along well. Set a simple rule upfront that some topics are off limits such as politics, religion, and how the Cubs won the World Series!· Keep It Simple. There is very little point in hosting a dinner party if you don’t enjoy it. The easiest way to do this is by keeping everything simple. What’s most important is your guests are happy and comfortable. Set a minimal table with a couple of candles and a little nature, like pinecones or greenery in a glass vase. Skip the formal dinner setting—save that for a family Thanksgiving or Christmas. Make it even easier by setting up a buffet table where your guests can help themselves. This also makes clean-up faster. · Set a Meal Theme. Since this isn’t a traditional Thanksgiving, feel free to have a little fun. Pick a theme such as Throwback Thanksgiving and have friends bring side dishes that were popular in another era. You can also ask your guests to dress the part. It will make for a memorable Friendsgiving! You can also step completely away from the typical fare of turkey and mashed potatoes and go with Mexican, Italian, or Asian. Or be bold and order pizza with store bought pies. Shortcuts are welcome here. You’re not trying to impress your mother-in-law with this one. Just remember to ask everyone to bring a side dish to help make your job easier, go potluck for the entire meal, or order it from a local restaurant. · Don’t Forget the Entertainment. No Friendsgiving would be complete without entertainment! Are any of your friends musically inclined? If so, have them bring their instruments and get a sing-a-long going. Another fun activity is karaoke. You can pick up a home karaoke machine very reasonably or find a used one. Put on some fun music and encourage everyone to pick a song. A simple homemade photo booth will also keep the fun going. Just hang a sheet or tablecloth on the wall, lay out some props and signs to hold (like “Friendsgiving 2016—Where You Can Pick Your Friends”). You can simply use the camera on your phone or let your friends use their own phones for photos. · Give Back at Your Friendsgiving. In America, 1 in 5 kids are struggling with hunger. Your Friendsgiving can make a difference. By hosting a No Kids Hungry Friendsgiving, your guests can have fun enjoying your dinner party while also giving to a worthy cause. No Kid Hungry will offer tons of resources to make your event a success from fundraising tips to exclusive chef recipes. Or you can simply ask each guest to bring a canned good to the dinner to donate to the local food pantry. · Don’t Forget to Uber or Lyft. Dinner parties like Friendsgiving usually include cocktails and wine. Relaxing and having a couple of drinks is expected. Just make sure your guests get home safely by calling Uber, Lyft, or a taxi.